Project managers drive the virtual prototype of the Citroen C3 Picasso through a computer-created version of Paris to see how it compares with other cars. Experts say carmakers are increasingly using three-dimensional design systems like the cave to save time and money throughout the product development and pre-production processes. PSAs virtual reality center opened in late-2004, just as work was starting on the C3 Picasso project. Having access to a cave allowed designers and engineers to test their ideas on life-sized, 3-D versions of the car without producing expensive physical models. For example, project managers tried 14 different instrument panels in the cave before settling on the version put into a physical model. PSA Vehicle Conception Manager Didier Lecoeur said the simulations look just like they would in the real world. And the time difference for making changes is simply incomparable, Lecoeur told Automotive News Europe. Lecoeur declined to say exactly how much money PSA saves by using the cave, compared with the old way of designing a car. 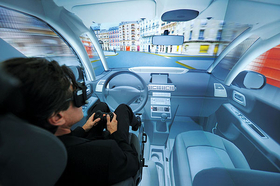 However, systematic use of virtual reality simulations is expected to reduce the average number of physical models built during new car projects from six to eight to just one or two from now on, said Olivier Petit, who headed the C3 Picasso vehicle architecture engineering team. The small virtual reality center is an increasingly important zone inside parent PSA/Peugeot-Citroens high-security design headquarters outside Paris, where digital design is now the norm. In the C3 Picasso project, code-named A-58, the cave played a key role in plans to design a small minivan on the platform used by Peugeots top-selling small 207 hatchback. 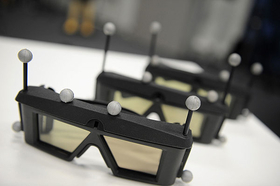 High-tech goggles are used to view the 3-D images beamed on to panoramic screens. The brief facing project managers called for optimization of the 207 architecture, for use on a minivan that would be big inside and small outside, said PSA Vehicle Conception Manager Lecoeur. The C3 Picasso will compete with the Nissan Note, Ford Fusion, Renault Modus and sector-leading Opel Meriva. Therefore, designers were instructed to match key minivan attributes, such as roominess or visibility, with specific design elements, like seat positioning or the exact view from the panoramic windshield, Lecoeur said during a visit to PSAs design center. Digital designs were regularly sent to the virtual reality studio, where a staff of 10 to 15 technicians created 3-D mock-ups for testing in the cave. During the testing process, project members use high-tech goggles to view the 3-D images beamed by five high-resolution projectors onto the caves five panoramic screens. Users have the impression they are actually sitting inside the car, giving them the ability to better judge how a door, a window or a clear glass roof will actually look in the car. At the same time, other members of the project team can follow their line of vision -- or see what they see -- on large projection screens behind the cave. What we learn from these simulations can convince us to change where a seat goes or the position of the sun visor. We see an evolution of choices from testing in the cave, said C3 Picasso vehicle architecture engineering Petit. The virtual reality cave is not only used for analyzing static styling questions. Project managers can drive the virtual prototype through a computer-created version of Paris, to get a more dynamic idea of how it compares when passing other cars. They can also put the car on a virtual assembly line, to test the feasibility of ideas -- often with suppliers and production engineers present -- in an industrial environment.